Ahead of Galaxy Unpacked 2018 we already know everything we could possibly want -- or need -- to know about the Samsung Galaxy S9 and S9+. A few details and specs have trickled out in recent weeks, but now the company has accidentally (maybe) published the launch video online. The new Galaxy handsets have the tagline "The Phone. 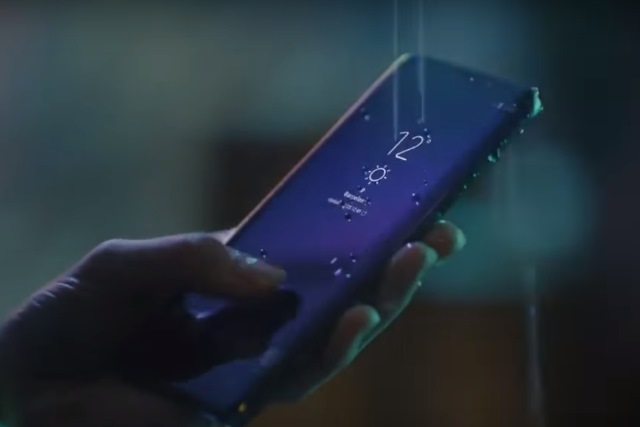 Reimagined", and the video shows off the waterproof capabilities of the phone as well as the new DeX Pad. There's also an automatic translation feature, a repositioned fingerprint sensor and AR features. And thanks to an article that was published a little early by the HuffPo, we know even more about the phones. The Huffington Post seemingly ignored the Samsung embargo and published an article about the Galaxy S9 and S9+ today. The article has since vanished, even from Google's cache, but not before it was seen by many people. The bezels on the 5.8-inch and 6.2-inch device have shrunk, enabling Samsung to keep the same sized bodies as the preceding models. Stereo speakers deliver Dolby Atmos surround support, and a dual aperture camera can operate at either f1.5 or f2.4. The camera is also capable of recording at an impressive 960 fps. The Intelligent Scan front camera can -- iPhone-style -- map your face and transform you into a 3D emoji. You'll notice that the fingerprint sensor has moved, and there's wireless charging support. The Samsung Galaxy S9 and S9+ will be available from March 16 in Midnight Black, Coral Blue and Lilac Purple.